Gary Pinkerton opens up the show talking about the importance of blocking out the bad and dramatically changing your life by training your thoughts. 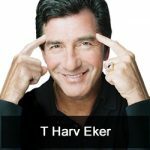 Then, Jason Hartman talks with T Harv Eker about his work Secrets of the Millionaire Mind, which reveals the missing link between wanting success and achieving it. Have you ever wondered why some people seem to get rich easily, while others are destined for a life of financial struggle? Is the difference found in their education, intelligence, skills, timing, work habits, contacts, luck, or their choice of jobs, businesses, or investments?